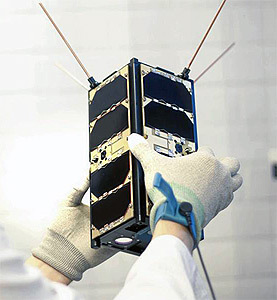 Reaktor Hello World is a modular 2U-CubeSat mission built by Reaktor Space Lab Ltd. to demonstrate a novel infrared hyperspectral imager and the Hello World platform for future LEO and deep space missions. The satellite will provide a beacon and telemetry data for which amateur satellite users and ham radio users will be able to receive. Determination and Control System), Antenna deployment system. Test the reliability of high performance industrial grade multicore SoC payload computer (Application Processing unit) with linux. Test the ability to make OTA-updates to the Application Processing Unit. Take and transmit pictures on request to the ground. Lower the barrier of creating software to space by increasing the abstraction level.